I guess I live a sheltered life, but where I'm from, shad is a bait for bass, walleye, and catfish. I just didn't know about an ocean shad. 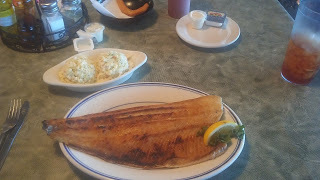 Ran across an article about "delicious shad" in Carolina...with the following pic. It does look good, but what does this taste like? We've caught numerous shad during the shad run on the DE river. From what I gather, the American shad spend most of their lives in the Atlantic, but go upstream to spawn. I don't know that it tastes any different caught from the ocean, but I've never developed a taste for the ones caught in the river. Thatnold joke about planking it and cooking slow on a grill for 4+ hours, then removing from plank, throwing away fish, and eating plank comes to mind. My BIL likes the roe. I don't care for that much either. 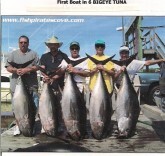 I used to catch them on the Cape Fear when I was younger. Fairly mild taste, so you'll probably want to season them. They are pretty bony as well. Shad roe is popular in the Carolina's, but I've never had a taste for fish eggs. Shad also run up here in the Delaware River, but I've never fished for them here. Yes, a whole different critter than what I know of...I just can't get past the thought of bait shad. For me, I guess it's one of those things where you eat it first, then find out what it was. An annual rite of spring in Virginia is the Wakefield Shad Planking, where large quantities of smoked shad and whiskey are consumed. This festival is every April in the Town of Wakefield on Route 460 near the Virginia Diner and has been held for about the last 70 years. Shad is rather bony however it, like herring, was a food staple of the early settlers. If I was hungry, I'd eat one. But they are fun to catch. It has been the start of the Virginia "political season"
Dhart, you're probably thinking about Gizzard Shad. 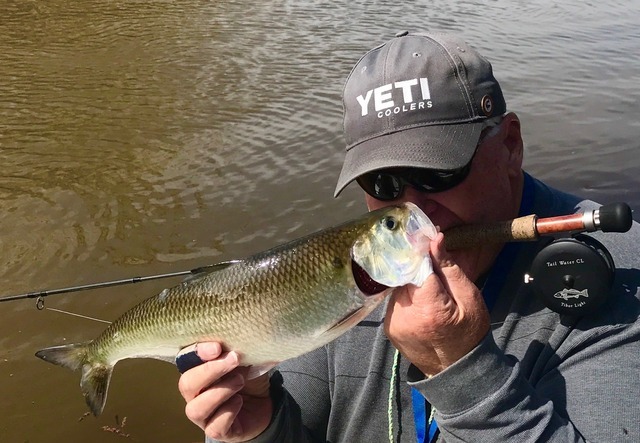 American and Hickory Shad have spawning runs every spring. They swim up the rivers they were hatched in. Here in Maryland, we haven't been able to keep them for years, catch and return only. My Dad used to love the roe, but like Judy the thought of eating it kinda wigs me out. They're a blast to catch. They call them poor man's Tarpon because of their fight and tail walking. They'll jump a few feet out of the water when hooked. If you ever get a chance to fish for them, try using a light action rod with 6lb. line. When they're running good, it's nothing to catch close to 100 in a few hours. They actually fed Washington's troops at Valley Forge during the winter when nothing else was available. I've already restrung my reels for this season. It's only a month or so away here in Md. I fish the Susquehanna River and another river closer to my house that not many people know about. Greg MD, the un-named river is very close to where you live. Probably less then 10 minutes if you live in Fallston. Indeed! It's been many years since I've been, but I've been to a few. Great event. I remember standing in line watching Chuck Robb make his way through the crowd. He was running for Governor at the time. The fella behind me was shorter than me (and that's short) so I gave a little room so he could see too. We shook hands and I told him who I was. He told me he was "the next Governor of Virginia." Turned out to be Doug Wilder, who did become the next Governor and the first black Governor in the country. It's fascinating to see the actual "shad planking." Done (they say) the same as it was done during colonial times. The smoke and smell of cooking shad stays in the air where ever you go. They serve the fish with coleslaw and hush puppies. 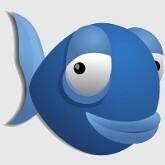 The fish is unremarkable and very bony. Not really worth the effort unless you're starving! They actually eat better if you use just a knife, just pull it down the plank and strip it and you will leave the bones behind. As far as taste they are fish and taste like fish they taste about the same as a fresh blue fish with the dark cut out. I put little value on peoples clams of seafood tastes anymore. Apparently everything is supposed to taste like skinless boneless chicken cooked on a grill with nothing and any deviation from that is bad. Big annual shad festival in Lambertville, NJ close to where I used to live. ^^ we used to fish in the Forks of the Delaware Shad Tourney, which is no longer held for the past several yrs. a 10 day event, with daily prizes for biggest Shad, and an end 1st, 2nd, 3rd place overall. They had a fest of sorts on the last day, too. We weren't die-hards like many participants were, but it remains a fun fish to catch (and release). Seeing my then 4 yo son fight one is still an outstanding memory. I'm about 20-30 mins from Lambertville, but I've never been to any of the Shad festivals up here. Most people I know are more interested in the Stripper runs that follow the Shad. Might have to check out Shadfest. Down south, we just went to the river (Cape Fear) and fished around lock 1. We'd have a cook out afterward, but never anything organized. It's probably different now. Those stripper runs. Can get expensive! I looked up that Shadfest, but it doesn't look my kind of scene. It seems to be more about arts and crafts and music. Nothing wrong with that, but you'd think they'd focus more on the shad. Not one picture of fishing for shad or even the fish itself. Yeah, it does look a lot more artsy now. I moved away 14 years ago. These things are beautiful, strong-looking fish...I just had no idea! Found this pic on a NC fishing forum, and they seem to be catching good numbers. Like Md.Chas said, use a light action rod and they are a very fun fish to catch. If you're in a good spot during a run you'll easily catch more than you want. We walked by one of the seafood markets today and the sign outside said they had boneless shad and shad roe! I might have to stop in tomorrow and get some for dinner.